If you ever check out the gift card offers on eBay Daily Deals, you might’ve seen the Travel Savings Card & Restaurant.com combo. I first noticed these offers in November 2017. The first option in particular seemed like it could be amazing value – for $25, I’d get $300 to spend on hotel, rental cars and activities, as well as a $100 Restaurant.com voucher. The $300 Travel Savings Card was the most tempting part of that equation. Despite knowing that this was likely to be too good to be true, I bought two of the combos for $50. Even if the Travel Savings Cards didn’t work out, I figured I’d eventually be able to use $200 of Restaurant.com vouchers. If you’re not familiar with Restaurant.com, it’s like a poor man’s Groupon; you buy a Restaurant.com voucher, then redeem it for discounts at participating restaurants. You might be able to find the occasional great deal, but the minimum purchase requirement usually makes the “deal” more expensive than it initially appears. For example, the screenshot below shows the options for That’s My Dog in Montgomery, Alabama. You can get a $10 certificate for $4 or a $25 certificate for $10. Both offer savings of 60% which are decent discounts, but it doesn’t quite work that way. That’s because the minimum purchase at this particular restaurant is $50. If you bought a $25 certificate for $10, you’d still need to spend $25+ more in order to reach the minimum spend. Your outlay would therefore be at least $35, meaning you’re only saving 30% rather than 60%. Like I mentioned earlier though, I was less interested in the Restaurant.com voucher and more intrigued by the Travel Savings Card element. When you purchase one of these combos, you’ll receive an email containing two codes – one for Restaurant.com and one for the Travel Savings Card – as well as links to their respective sites where you redeem the codes. On the Travel Savings Card site, you simply enter the code and click Activate. The value of your card will then be added to your Savings Bank balance. Your Savings Bank balance can be used to offset the cost of hotels, cars, bonus weeks (what appears to be timeshare accommodations) and activities. All’s not as it appears though as my $600 doesn’t always give $600 in savings in the way that I’d expect. If you’d like to test out how the Travel Savings Card works, they have a demo site which you can play around with. Although it’s just a demo site, it appears to offer the same results you get when you have a Savings Bank balance. The demo site on the Travel Savings Card domain gets stuck in an endless redirect loop. However, there’s a second demo site at Travel Savings Passport which offers the same results. You might need to change the language to English, as it appears to default to Spanish. Here are some examples for how the Savings Bank balance is applied to each option. When clicking on the Hotels tab, you’ll be taken to a search page where you can enter your desired location, dates and number of guests. I did a random search in Orlando for two adults in April for seven nights. This brought up a list of 290 hotels, including brands from Marriott, Hilton, Wyndham and more. For comparison, a similar search on hotels.com showed there being 3,235 hotels and vacation rentals to choose from. OK, so the Travel Savings Card is off to a bad start, with less than 10% of the selection that hotels.com has. It’s not all bad news though, as there are definitely some savings to be had. Having a quick look through the hotels on the first page of results, I picked the DoubleTree at SeaWorld seeing as it’s somewhat affordable and is at a popular destination. Its ‘Public Price’ was listed as $1,364 for the week; with my $600 Savings Bank balance, that meant I’d be paying $764. When taking into account the $50 I paid to get the $600 in Savings Dollars, my outlay would be $814 for the week or just over $116 per night. How does that stack up when compared to other booking methods though? A search on Hilton’s website for the same dates offered $1,493.56 for the week as the lowest cost, or just over $213 per night. That’s almost 84% more expensive. When booking directly with Hilton, the lowest cost room had two queen beds, rather than the twin room and ‘guest room’ options displayed when booking with Travel Savings Card. I’m guessing that the Travel Savings Card option doesn’t include resort fees. If it doesn’t, that’d make that option $157.11 more expensive ($19.95 per night plus 12.5% tax). That still makes it almost 54% more expensive to book through Hilton. To be completely honest, I was staggered by this. Admittedly, it’s only an analysis of one hotel rate, but savings of 54-84% are excellent. Once again, Travel Savings Card appears to have the edge, saving $14 on the Economy option, $30 on the Compact and $36 on the Intermediate. As you can see, they have most of the major companies, with the exception of Hertz and Advantage. The cheapest option is Fox at $222 for the week which would reduce your Savings Bank balance by $44. Based on the original cost of the Travel Savings Cards, that $44 discount effectively cost $3.67, making the total cost ~$226. That’s therefore $32 cheaper than booking the Intermediate option at Fox through CarRentals.com which was the cheapest option listed on Kayak. A credit card is required for the reservation, so you’d be prepaying for the rental. On the example I looked at, there’s a $45 fee for cancelling more than two days before pickup. The fee increases to $60 if cancelling within 48 hours and no cancellation is allowed on the day of pickup. The Bonus Weeks tab appears to offer a week’s vacation in various timeshare properties, primarily in the US and Mexico. When researching this, there were 138 weeks bookable at 50 resorts. The cheapest weeks started at $114 although that would presumably vary throughout the year based on availability. $114 for a week at an all-inclusive resort sounds too good to be true. This resort is all-inclusive, but the all-inclusive fee is not included in the price and must be paid directly to the resort. The problem is that it doesn’t state what that all-inclusive fee costs. It also says that the studio room sleeps four people, but only your name appears in the Guest Information area. Does that mean three people can join you, or will you be having a lonely vacation? It’s not at all clear and the Travel Savings Card customer service team isn’t particularly helpful either. After emailing them last year, it took a few days to receive a reply and they didn’t answer my question. My parents are planning on visiting us next year when we get to Arizona on our 50 state road trip. They live in the UK and have always wanted to see the Grand Canyon, so we’ll be taking them there. One of the Bonus Week options is at the Wyndham Flagstaff in Arizona which could be a perfect place for the four of us to stay. At this point in time though, the only week available is April 22-29, 2018. That stay would deduct $500 from my Savings Card balance, with the remaining cost being $720. That $500 effectively cost $41.67, so that puts the total price at $761.67. If booking the same type of room at this property through hotels.com, the cost would be $1,193.20. If you wanted to stay at that specific resort and those dates worked for you, you’d be saving $431.53 by booking through Travel Savings Card versus booking through hotels.com. These Bonus Weeks from Travel Savings Card therefore appear to offer good value for paid stays if you’re flexible with your dates of travel, where you want to visit and where you stay. Your fourth option for Travel Savings Card redemptions is to book activities. Sometimes this offers OK value, other times…not so much. A month ago we were in Atlanta and we’d been considering a visit to Zoo Atlanta. If booking directly with them, two adult tickets would’ve cost a total of $45.44. This included tax and an online processing fee. Another option was booking through Viator. The base cost of the tickets was exactly the same as booking directly, but it was cheaper overall as Viator didn’t charge tax or an online processing fee. A benefit of booking through Viator is that you can earn cashback through a portal, plus it codes as travel for 3x Ultimate Rewards on the Chase Sapphire Reserve card. An alternative would be to book it through IHG’s activity portal which is run by Viator. The cost would be the same as Viator, you’d still earn 3x with the Chase Sapphire Reserve but you’d earn 1,000 IHG Rewards Club points rather than portal cashback. We then come to the Travel Savings Card activities portal. The base ticket cost would be the same as all the above options, but they only apply some of your Savings Bank balance to reduce the cost. They appear to apply a different percentage discount to different activities. In this case, the discount was $3.18 – an 8.16% saving. That’s the cheapest of all the available options above, but you’d be forgoing 3x Ultimate Rewards and portal cashback or 1,000 IHG Rewards Club points in this particular scenario. Booking activities through Travel Savings Card doesn’t even offer the lowest price in all cases. For example, let’s say two adults wanted to visit the Legoland Discovery Center in Dallas. Booking through Travel Savings Card costs $35.42; the tickets are $41.98 and $6.56 is deducted from your Savings Bank balance. If booking directly with Legoland more than 24 hours in advance, you can get adult tickets for as low as $15.99 per person. With tax included, the total comes to $34.62 – $0.80 cheaper than through Travel Savings Card. You can do even better than that though. 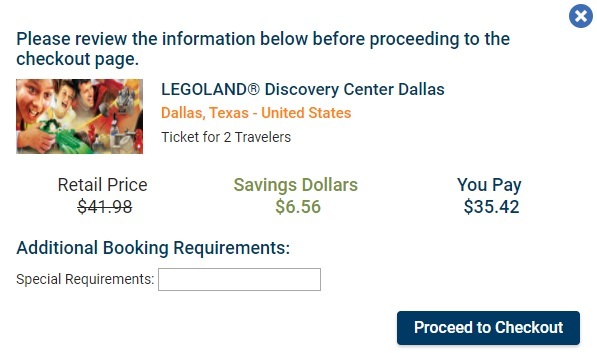 When researching ticket prices, I noticed that you could buy Legoland Discovery Center tickets on Groupon (that Groupon’s since expired.) For two flexible admission tickets – good for an adult or child – you’d have paid $34.98. Groupon frequently offers limited-time coupon codes. At the time, they were offering 10% off on some activities and 20% off others; Legoland was one of the 10% off options. That took $3.50 off, making the total cost $31.48. If you paid with a discounted Groupon gift card, you could save at least 10% more. With that further 10% discount, your cost would be $28.33 – $6.29 cheaper than booking directly and $7.09 cheaper than booking through Travel Savings Card. I’ll give Travel Savings Card its due – it provides better value than I thought it did. Hotels – It seemed to really shine with the Orlando hotel search that I shared above. I’ve done another couple of searches for other locations and the discounts weren’t as high as 54-84%. In those cases, passing up portal cashback, status benefits, points and elite night credits probably wouldn’t be worth it. You’d therefore need to compare your options to see which provides the best value. As a general rule, you’ll probably get the best value when booking stays at hotels where you don’t have status and don’t (or can’t) earn points such as at boutique hotels. Rental Cars – Booking a rental car through Travel Savings Card probably isn’t worth it. Although it appears to offer slightly lower prices, you’re forgoing portal cashback and other potential discounts. More importantly, you’d be prepaying for your rental and you’d have a somewhat strict cancellation policy. That’s off-putting when booking far in advance, although the risk is reduced if you’re renting a car at the last minute. Bonus Weeks – These timeshare weeks definitely offer the potential for getting some good value out of your Travel Savings Card. If you can be flexible with the location and dates of where you want to visit, you could save hundreds of dollars on your accommodation. Activities – When buying my Travel Savings Cards, I’d thought that booking activities might be its best value proposition. In reality, the opposite is true. As it only deducts a small percentage from an activity’s cost, you’ll often be better off booking tickets elsewhere. Should You Buy A Travel Savings Card? Tentatively, I’d say yes. Ultimately, it depends on your travel style, so it’s not a good option for everyone. However, at $25 for a $300 Travel Savings Card and $100 Restaurant.com voucher, it should be possible for most people to get at least $25 of value from that combo. Your Savings Bank balance doesn’t expire, so that reduces some of the risk of buying a card and not being able to use it immediately. Have you bought a Travel Savings Card? If so, what have your experiences been? Have your hotel bookings or timeshare weeks worked out as planned? Did you have any issues with car rentals? Do you have any tips for maximizing its value? Please let us know in the comments below. Stephen, did you actually try to book a room with these cards? Everything I read online says people had nightmares after actually attempting to book (rooms availability “gone missing”, being walked to a different hotel, etc) it seems a bit early for any recommendation, but I’m skeptical about recommending anyone buy it for the travel benefit. I haven’t actually redeemed any of my Savings Bank balance for a stay yet, so I’ll update the post once I’ve booked a stay to update on that part of the experience. Do we know anything about the history behind the Travel Savings Card and who the parent company is? Are they linked to restaurant.com? If history is any indication, this seems like a semi-sketchy operation that won’t provide a lot of value in most instances, but if you play around with it and are reasonably flexible, you might be able to extract some good deals from the complexity of it all. Yep, flexibility – especially with the timeshare element of it – seems like it’d help provide the best value. When submitting a question online, I received a reply with an email address that ended in @vacationowners.net. That seems to be some kind of timeshare company, so I think it’s a partnership between them and Restaurant.com unless Restaurant.com is owned by the same parent company. Interesting. I’ll await reports of any success with this program. I’m extremely skeptical. How do these prices compare to other member only hotel booking sites like Club1? I’m not a member of Club1, so I’ve not been able to check. At the very least, their selection seems to be different – Club1 only has 4 & 5 star properties, while Travel Savings Card also appears to have 2 & 3 star properties. I managed to find a link to get a free one year membership of Club1, so I just registered with them. I did an identical search to the one I mentioned in the post (a week in Orlando from April 4-11). The lowest cost of the DoubleTree at Seaworld with Club1 was $1,305.36 vs $814 with Travel Savings Card. That’s only one example and it may well be an outlier, but it looks like the Travel Savings Card has the potential to save a fair bit of money so long as the booking goes through properly. So to me it seams like the price is great if you have the discount code, but that’s one time right? So great for initial booking and afterwards a competitive online price. The discount comes out of your Savings Bank balance, so if you top up the balance with more Travel Savings Cards from eBay (or directly from Travel Savings Card) you should continue getting discounts. Thanks for the in depth write up. I was on the fence about purchasing this card via a deal through my work for a $1500 card + $100 restaurant gift card for $70, so I think I’ll pull the trigger now. I also played around with the demo and chose ski resort destinations in Colorado. There was a decent selection with some 5 star resorts included with savings from about $200-500 for a week compared to other online booking sites. Im just curious if there’s some hidden issue with redeeming the savings, so fingers crossed. Let us know your experiences when you come to redeem the card. I’m looking at the exact same deal through my work. I need a family rental car for a week, so worst case scenario I can just use the $100 restaurant.com card and book a bar last second through my work discount. Can you let us know how it worked out for you and if you were able to book easily? Thank you. I think that I originally misunderstood the “deal”. It isn’t a $1500 gift card, but rather $1500 of credits where you can use part of your $1500 bank towards their discounts. I reread Stephen’s article above and it made a lot more sense. The discounts for car rentals don’t come close to my employer discount and may even be worse than what I saw on orbitz and other sites. I guess I’m glad I didn’t buy it. Oh well. I still haven’t gotten around to using the savings balance as we’ve been mostly staying with friends and in Airbnbs for the past couple of months. I think this is a scam. Tried it and had problems booking. Tried to call 1800 and the automated machine will give me more ads to offer and nobody to direct your call to a representative. Waste of time. has anyone been able to use this yet? now they are offering $1000 in travel for only $29. My experience last year was excellent, booking a hotel in Mexico. I was very skeptical but it worked terrifically.